Defense « Global Market Insights, Inc. In an age where information is power, the synthetic aperture radar (SAR) in space sector industry has permitted governments and organizations access to high resolution imagery for supporting advanced sensing and monitoring systems. With the ability to gather data efficiently even in the most challenging weathers, SAR is a significant tool for surveillance and remote detection especially in the tropical regions that are covered under clouds for most of the year. The growing adoption of SAR in environmental screening and military applications is particularly expected to bolster the global SAR in space sector market. As per the United Nations Office for Outer Space Affairs (UNOOSA), around 357 objects were launched into space in 2017, indicating the progress of space tech worldwide. Advancements in satellite technology have opened avenues for the use of imaging tools to monitor tectonic movements, ocean currents, groundwater levels and forest conditions from outside the atmosphere. Touted as being a “cloudless” image sourcing technique, SAR has emerged as an ideal integration into satellites and in 2017 the SAR in space sector market earned more than USD 1.4 billion in remuneration globally. In principle, synthetic aperture radars transmit microwave pulses through an antenna, which are directed toward the earth’s surface. When the microwave energy is scattered back to the device, it is measured accordingly, and two or three-dimensional images are formed by using the time delay of the received signals. As microwave consists of electromagnetic radiations that have high cloud penetration, SAR satellites can provide images which, unlike conventional satellites, are not hindered by climatic conditions and also allow night-time operations. These advantages over optical imaging systems will deliver enormous growth to the SAR in space sector industry. Apart from the 24-hour data acquisition ability, other distinguished features of synthetic apertures which have propagated the SAR in space sector industry trends are high spatial resolution, unique data about surface roughness & physical structure and modern SAR satellites with exceptionally long operational life. Governments agencies are able to study deforestation patterns, tidal inundations, land-use in urban & rural areas and other landscape characteristics with continuous data availability for elongated periods. As an active remote sensing device, SAR has displayed immense potential in gaining tactical high-ground over rival nations since it can supply high-quality reconnaissance data to the military. Allegedly, defense applications procured a major chunk of the global SAR in space sector market in 2017 and led the industry landscape. However, the commercial significance of SAR in space sector is being increasingly realized, where exploration of natural resources and maritime navigation safety are examples of activities that can benefit by the deployment of SAR satellites. Demonstrating the influence of SAR in space sector, China had launched its own first SAR satellite in August 2016, named Gaofen-3, having the highest number of imaging modes amongst all SAR satellites and boasted to have an accuracy to one meter in distance. It has a long lifespan and its data can allegedly be used in disaster prevention, ocean monitoring and maritime rights protection. In another instance, Iceye, a space startup from Finland, launched its commercial satellite ICEYE-X1 in January this year, which was the world’s first SAR satellite to be under 100kg. The information received from this microsatellite is deemed to be used for a wide range of activities that include maritime tracking, tracing oil spills, monitoring sea ice and other environmental issues. The company is also developing a constellation of SAR satellites to apply across the commercial zone, and already has an algorithm to extract data of marine vessels and their locations. These examples are indicative of the promising future prospects for the SAR in space sector industry, which is estimated to show 11.5% CAGR over 2018-2024. The SAR in space sector market is constituted of space agencies, IT companies and start-ups working together to produce multi-satellite constellations, which utilize several SAR satellites flying together in a pattern to gather and transmit data. Such endeavors are becoming possible with spacecrafts and programs made for launching multiple satellites at a time, the most notable instance being the 2017 launch of 104 satellites by ISRO in single mission. Recently, the dynamics of the SAR in space sector industry has been impacted by the necessity to reduce the overall size of satellites in conjunction with improving the image resolutions and accuracy. All in all, with the technology appetite increasing by the day, the overall industry has a slew of opportunities ahead in terms of profitability as well as innovations. 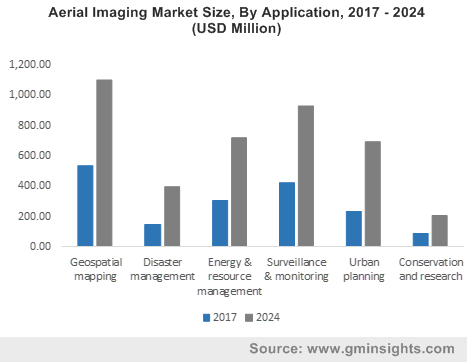 Some of the renowned names comprising the competitive hierarchy of synthetic aperture radar (SAR) in space sector market include Harris Space and Intelligence Systems, Terra SAR-X, OptiSAR and startups like ICEYE and Capella Space. This entry was posted in Automotive & Transportation and tagged C Band, Defense, Environmental Monitoring, Frequency Band, K Band, Ka Band, Ku Band, L Band, Multi-frequency Band, Natural Resource Exploration, Public Safety, Research & Commercial, S Band, SAR in Space Sector Market, SAR in Space Sector Market Analysis, SAR in Space Sector Market Research, SAR in Space Sector Market Share, Single Frequency, Synthetic Aperture Radar in Space Sector Market, Synthetic Aperture Radar in Space Sector Market Report, X Band. Primarily driven by the improving global economy and rising disposable income levels, catamarans market has established a remarkable reputation for itself in the worldwide industry of water vessels. Technological innovations in agility & speed and the spotlight put on catamarans’ sports in the 2013 America’s Cup have expanded the appeal and popularity of this business sphere, in turn encouraging industry players and sailing enthusiasts to invest generously in this sector. In fact, water sports activities such as boat racing, cat racing, sailing, and motor sports have gained immense momentum in the recent years, thereby augmenting catamarans industry players to come up with latest technological advancements & innovations. Citing a recent instance, Cape Dory Cruisers and Catamarans have collectively introduced a complete new range of power boats varying in size between 22-36 feet. The new vessels, according to the reports, are designed to provide efficiency with low structural weight and help lower fuel consumption. The firm plans to phase each model into the market in stages through a network of select dealers across North America and rest of the world. Cape Dory’s introduction of range of water vessels, according to industry analysts, is one of the classic examples of the robust demand and the incredible growth the catamarans market is experiencing in recent years. The evolution of the modern catamaran from the simple double canoe to the most impressive multihulls across the globe has accelerated even more, with all the latest innovations in materials and structures – a factor that has further contributed to the unprecedented growth of the catamarans industry. A report by Global Market Insights, Inc., further sheds light on the robust growth of this industry by claiming the global catamarans market to have pegged USD 1.5 billion in the year 2017. The report states that rising urbanization, the growing fleet of upper-class end users spending on luxury and leisure, and the expansion of the travel & tourism industry have augured well for the growth of catamarans market in the past few years. In fact, if reports are to be believed, the travel & tourism industry has emerged as one of the fastest growing economic sectors registering a 4.6% growth in 2017 – a 50% faster rate than the global economic growth. 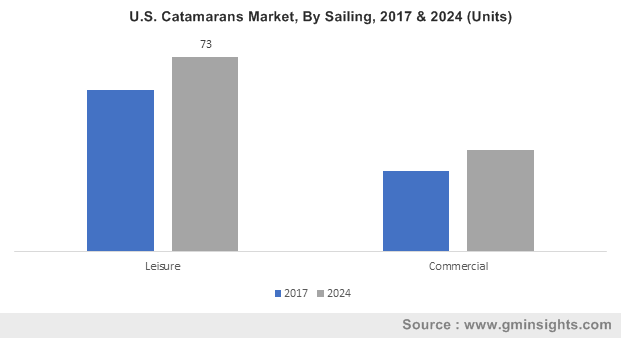 With such strong prospects and continued momentum, catamarans market has been anticipated to grow in excess of 6.5% each year through 2018-2024. Much of US’s outbound growth may be attributed to the region’s advanced infrastructure, strong economic growth, and higher leisure spending capacity. In fact, the region is registered among one of the highest income spenders on recreational activities in the boating sector. The propagation of stringent regulatory norms toward coastal security has also significantly changed the growth prospects of the U.S. catamarans market for the better. According to an estimate released by the U.S. Coast Guard in 2015, the nation recorded 4158 accidents including 2613 injuries and 626 deaths that accounted for property damages surpassing USD 42 million. Catamarans however, are designed to have a balanced structure & provide better safety from such accidental cases. These factors are held in high regard in shaping the growth trends of U.S. catamarans industry, projected to surpass a volume of 567 units by 2024, with an estimated 3.4% CAGR over 2018-2024. The governmental defense and regulatory contributions toward catamarans industry is not limited only to the U.S., even the Asia Pacific region with China at its foray has been investing heavily to enhance the continent’s marine & defense infrastructure. It is prudent to mention that China has built over 80 different variety of Type 22 Houbei-Class – a catamaran designed with fast & sharp attack missile craft feature, to fasten its coastal safety & security. The shifting focus of countries worldwide toward shipbuilding will have a lasting impact the profitability landscape of catamarans market, as is rather overt from the aforementioned regional trends. Aided by such as strong topographical landscape and product innovations in line catamarans market share is certain to upsurge in the ensuing years. This entry was posted in Automotive & Transportation and tagged Catamarans Market, Catamarans Market Analysis, Catamarans Market Report, Catamarans Market Share, Commercial, Defense, Leisure, Powered Catamarans, Sailing Catamarans, Yacht Market Catamarans. The changing face of warfare in the recent years has been a pivotal factor stimulating military drone market. 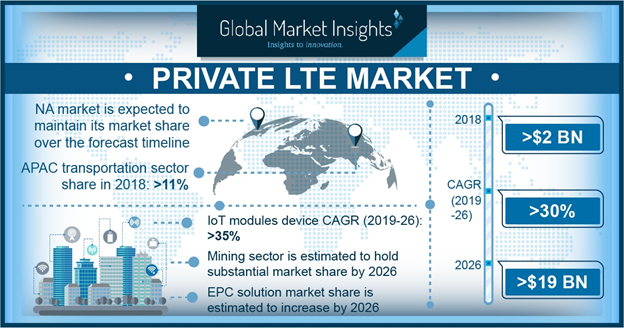 Aided by cumulative product demand and rapidly progressive technological advancements, this vertical is expected to add a new dimension to the evolving smart industry. Ironically, the latest news about the U.S. military having developed drones that can decide who to kill has created major undulations in military drone industry. As a potential aftermath, the world is still debating over what such a technology can mean for the future of warfare and war ethics. However, it would be fair to state that the advantages of using drones in warfare and military operations have surpassed all debatable boundaries. This is quite evident from the estimates that claim military UAV market share to register a CAGR of 12% over 2017-2024. 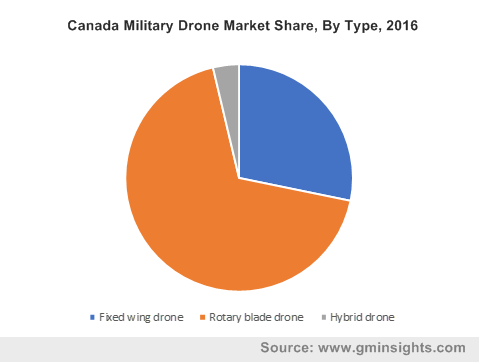 It has been anticipated that North America, by 2024, will be accounting for 70% of the overall military drone market share. This expansive growth can be aptly credited to the heavy adaptation of drones in civil applications and the ongoing ‘War on Terror’ that the U.S. is current involved in. Till date, the United States has carried out several lethal drone strikes in Pakistan, Somalia and Yemen. Incidentally, these are the countries that the U.S. and its allies are not openly at war with, as is the case with Afghanistan, Libya and Iraq. As a measure to extend the reach of the war against terrorism, the U.S. has also concentrated its drone campaigns in North Africa, using Predator drones for surveillance and targeting radical terrorist groups. Undeniably, U.S. has emerged as a viable revenue pocket for North America military drone market. Of late, drones are being designed with an element of human intelligence that make for highly effective weapons to locate and targeting terrorist operations and have effectively shifted the cost calculation for battles. Drones can be deployed for longer period of time and with less inconvenience to human resource. Specialized military drones in fact, are more lethal at reduced financial cost and potentially diminish the risk of life for those who control these drones as compared to ground forces or piloted aircraft. Driven by their highly commendable advantages, it has been forecast that military UAV market outlook looks rather promising for the future, where there are chances for increased covert drone warfare and less declared warfare. The effectiveness of military drones, as demonstrated by the United States, has caught the attention of nations that have been aiming to achieve a robust arsenal of weapons. Thus, countries like China, Russia, Iran, Pakistan and Turkey have invested in research and development of drone programs, a trend indicating the strong growth of the military drone industry in future. China recently set a world record in its demonstration of drone swarm, a topic of much discussion for its implications in the future of warfare. China has used the popular notion of using an overwhelming number of drones to gain tactical advantage over a target and flown 1108 dronebots as a single unit to exhibit the skill of its drones in autonomous flight capabilities and intelligent use of instruments. Apart from purely military uses, these UAVs have been successfully deployed to carry out other government-controlled operations like search and rescue, wildfire containment, surveillance and law enforcement, further adding stimulus to military drone market. For instance, the Police Aviation Administration Office in China have put 300 police drones to patrol areas that are too difficult for the police to access. These drones have successfully collected information about drug manufacturing dens and have facilitated police raids in these areas. In the U.S., Predator B drones have been deployed for US Mexico border patrol to stop illegal border crossing across the remote mountains, rivers and canyons. These instances provide pivotal evidence that military UAV industry is here to stay. With the proliferation of advancements in military drone market and the changing implications these developments will have on warfare, regional governments plan to establish a common ground to discuss and set guidelines for the sustainable and beneficial use of military drones while safeguarding human interests. As the use of drones have far reaching consequences that are not limited to warfare, the trend for developing and using military drones across myriad applications will continue to remain consistent in the next few years. As per estimates, military drone market size will be pegged at USD 13 billion by 2024. This entry was posted in Sustainable & Smart Technologies and tagged Autonomous, Battle Damage Management, Beyond VLOS, Border Management, BVLOS, Combat Operations, Defense, Elevated VLOS, EVLOS, Firefighting & Disaster Management, Fixed Wing, Global Military Drone Market, Government, Hybrid, Intelligence, Maximum Take-Off Weight, Military Drone Market, Military Drone Market Forecast, Military Drone Market Segmentation, Military Drone Market Share, Military Drone Market Size, Military UAV Market, Police Operations & Investigation, Remotely Operated, Rotary Blade, Semi-Autonomous, Surveillance & Reconnaissance, Traffic Monitoring, Visual Line of Sight, VLOS. The rising terrorist activities across the world has led to high demand for arms & ammunition, thereby fueling global ammunition market size. Stringent measures introduced by the governments of various countries to fight against terrorism and heated inter-continental disputes will also spur the industry trends. According to Global Market Insights, Inc., “Worldwide ammunition market was worth USD 9 billion in 2015 and is slated to record an annual growth of 2.8% over the period of 2016 to 2025.” The growing investments in R&D activities to enhance and develop technologically advanced weaponry coupled with the concerns regarding national security will bring forth lucrative avenues for the global ammunition industry. Taking into consideration the products, ammunition industry is segmented into artillery, medium caliber, mortar, large caliber, and small caliber. Mortar ammunition market will exhibit an annual growth rate of around 3.3% over the period of 2016 to 2025, owing to its surging usage in low firing pressure arms. Small caliber ammo is predicted to record notable growth rate over the coming eight years. The product demand can be attributed to its high demand across civil and military applications, owing to its ease of application and easy availability. Defense and civil sectors are the two prominent application areas of ammunition market. Defense sector led the application landscape in 2015 and will continue its dominance by occupying more than 50% of the total industry share over the period of 2016 to 2025. 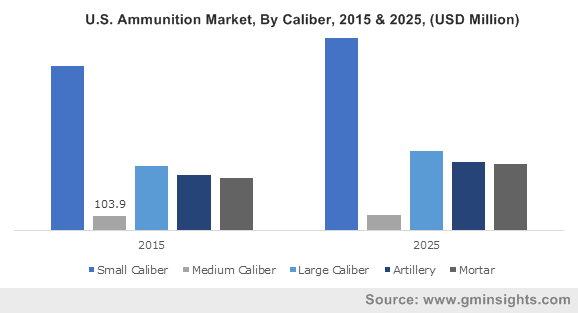 Ammunition market size in civil applications will also grow lucratively over the coming timeframe, driven by its high demand in Law enforcement, self-defense, entertainment, and sports activities. Considering the regional landscape, North America ammunition market is slated to exhibit noticeable growth rate over the coming eight years. U.S. will cover more than 90% of the North America regional share by the end of 2025. The growth can be attributed to its increasing requirement for shooting sports and the defense sector. Asia Pacific ammunition industry accounted for 28% of the global revenue in 2015 and will register a lucrative growth rate over the period of 2016 to 2025, owing to the huge allocation of financial budgets for the defense sector. The rising demand for ammunition in sports and entertainment activities will also favor APAC market growth significantly. Russia ammunition market will generate considerable revenue over the next few years, as it is a prominent arms producer. In addition, Russia is the main distributor of the defense equipment across the world. The market is highly fragmented in terms of regional manufacturers. Most of the industry giants are looking forward to develop cost-effective and advanced products as compared to their competitors. To multiply the revenue generation, key players are adopting business strategies such as mergers & acquisitions to sustain their market position. Notable participants in ammunition market are General Dynamics Corporation, Nammo AS, Olin Corporation, Remington Arms Company, Inc., Orbital ATK Inc., Federal Premium Ammunition, BAE Systems, Denel PMP, Global Ordnance, RUAG Ammotec, Hornady Manufacturing, Maxam, Poongsan Corporation, and Nexter Systems. This entry was posted in Sustainable & Smart Technologies and tagged Ammunition Market, Ammunition Market Analysis, Ammunition Market Share, Ammunition Market Size, Ammunition Market Statistics, Ammunition Market Trends, Artillery, Defense, Large Caliber Ammunition Market, Medium Caliber Ammunition Market, Mortar, Small Caliber Ammunition Market, U.S. Ammunition Market.